Enjoy a relaxing outdoor YOGA session among the beauty of our Warren County farm! Join us on the farm for a fun, creative, hour long outdoor yoga session. FARM YOGA IS AVAILABLE AT OUR WASHINGTON, NJ LOCATION ONLY. Join us for our first ever ‘Yoga on the Farm’! 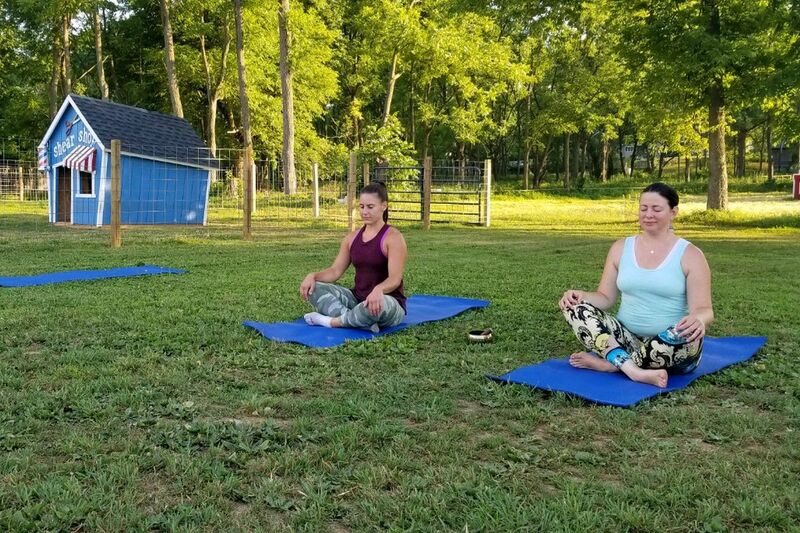 VonThun Farms & M-Power Yoga have teamed up to bring you the serenity of a peaceful yet powerful outdoor yoga practice surrounded by our inquisitive barnyard animals & the gorgeous views of mountains and lush, growing farm fields. Farm Yoga has many benefits and ways to nurture us with mindful movements, deep breathing and the experience of the present moment. You’ll be invited to nourish your spirit, relax your mind and support your body as we practice Fun Flow style classes for all levels and ages. Although registration is suggested,< www.m-poweryoga.com/farmyoga > it is not required. WHEN: Sessions are offered sporadically throughout the summer on alternating Thursday nights & Saturday mornings. See schedule below. COST: $15 per class. Participants will receive a 10% off farm market homegrown produce voucher at each session.